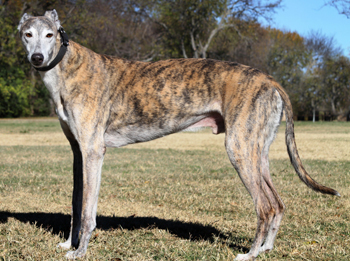 Boogie, aka Boogie Beat, is a handsome 9½-year-old brindle male born February 27, 2001. His sire is Rocksteady Eddie, and his dam is Boogie Dog. 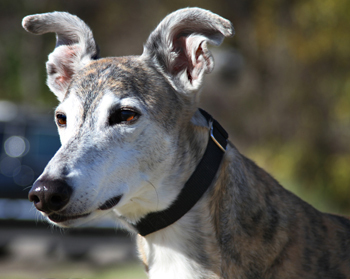 Boogie has 108 races under his belt, starting November 17, 2002, at Gulf Greyhound Park in La Marque, TX, moving to Birhimham Greyhound Track in Alabama, then on to Corpus Christi Greyhound Track in Texas, then to Valley Greyhound Park in Harlingen, TX, Flager and Naples-Ft. Meyers Greyhound Tracts, and finally retiring December 10, 2005 at VRP in La Marque, TX. Boogie was adopted and in a home for almost 5 years; but because of a change in the family environment, through no fault of his own, he was returned at almost 10 years of age! 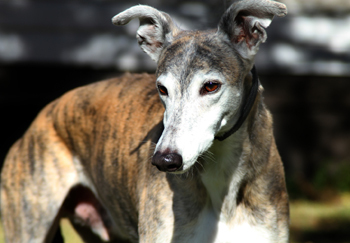 An easy going kind of guy, Boogie will be a greyt addition to the lucky family who adopts him. Boogie is cat and small animal tolerant.